A couple of these showed up at my place this week. Picking up a copy of one of your books for the first time--I can't imagine that moment will ever get old. Thanks to everyone at Harper for a great cover! And thanks to Stephen Coonts for the blurb! Looking forward to it! I had a blast with The Breach, and definitely wanted more. 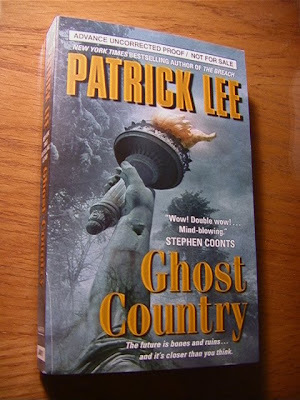 Hadn't heard much about Ghost Country in a while, so was a little worried, but good to see it's finished and on its way! hey, patrick - that looks AWESOME! what's the release date? Hey everyone! Thank you! Ha, I need to check comments more often. Release date is December 28. See you in San Francisco, Sophie! Lee Child had it right...great read! Any chance of getting a book signed in San Francisco? In this modern day one can empathize with Finn's demented views. oh and I read it in 2 nights. Just found you (and your books) from a link over at Jeff Somers blog and just wanted to say 'hi'. Off now to try and find a copy of Breach so I can catch up with everything. They sound like they're right up my street. What an amazing book Ghost Country is. I picked it up mainly due to the blurb from James Rollins and couldn't put it down. Next day I bought The Breach and went backwards. Now I'm caught up and eagerly awaiting the next book. Excellent books. I bought the book, started reading, and couldn't put it down. I had no idea it's part of a trilogy. I'll have to read the others for sure. It's been a while since I read a book cover to cover in less than 24 hours. Kudos, Patrick Lee!